Alright clogs, I'll give you a shot. I've been trying to think about how I'm going to work the new clog trend into my wardrobe now and in the Spring without looking silly. Clogs don't really seem to fit in with the rest of my platform, 5 inch stilettos. 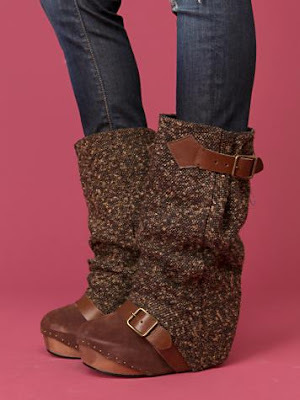 That is until I found this pair: A clog-wedge hybrid of slouchy amazingness from Free People. This shoe takes out everything that I hate about clogs (your foot not covered in the back and a sometimes low chunky heel) and puts in everything that I am all about right now (wedges and buckles). Plus the little bullet detail in the front and a peek of wood keeps the clog charm that we all know and love. I have already reserved a spot for them in my closet.